THE HEAVENS—Saying He was a very rigid and domineering Father in the years immediately following the Creation of Man, the Lord God Almighty admitted Monday He has been far less strict with His last few billion children. 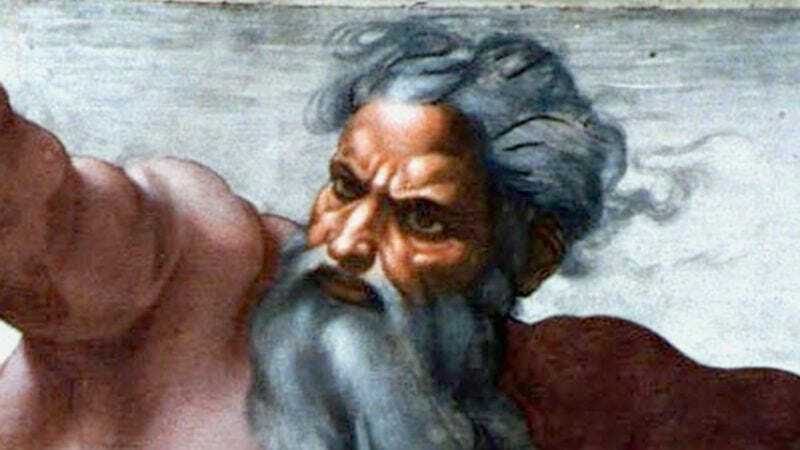 “I was kind of a stickler back then, to be honest, and I could be pretty harsh when I punished my children for doing something wrong or disobeying me,” said God, who remarked that He has mellowed out quite a bit over the millennia and that it has been a long time since He has sent forth floodwaters to cover the face of the earth or cast any of His children into a lake of fire. “Back then, I was still learning how to be a good Father of all Mankind. I can see that now. And I used a more disciplinarian approach, sending down a plague, slaughtering all the firstborn and livestock—things like that. After a while, though, you realize you just have to let your children live their lives and make their own mistakes.” The Lord added, however, that He has perhaps been too lenient with His children of late, and the minor disciplinary measure of an earthquake next week that will kill 300,000 should be enough to set them straight.